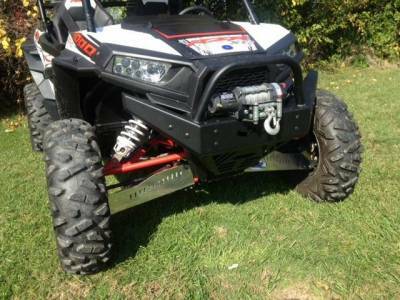 Polaris RZR XP1000 and 2016 RZR 900 Extreme Front Bumper / Brush Guard with Winch Mount Fits: 2014-2016 RZR XP1000 (XP1K), 2016 RZR 1000-S, 2014-2016 RZR XP1000-4 (4-seater), 2015 RZR 900 and 2015-16 RZR 900-4 (NOTE: This has never been tried on the 2016 Turbo Model therefore we do not know if it fits) Made from 1/8" thick and 3/16" thick American Steel. Powder coated texture black for superior protection. Mounts behind the radiator, unlike factory bumpers. Fits most winches up to 3500 lbs. Allows you to mount your winch up high out of the mud and water or behind the radiator (see notes below if mounting behind the radiator). Top Mounting Accepts both wide Spool UTV Winches (6-5/8” x 3” deep, bolt pattern) and Standard Spool UTV Winches (4-7/8” Wide x 3” Deep, Bolt Pattern). Laser Cut and CNC Formed to ensure a perfect fit. Laser Cut EMP Logo. Made In Cleveland, Ohio. If you are mounting a winch behind the radiator you will need a winch mount P/N: EMP- 12363 and an additional Fairlead (see install video). NOTE: due to frame restrictions if you are mounting a behind the radiator you will not be able to use a wide spool winch. If mounting a winch on top you will only need the fairlead bracket that comes with your winch. If you do not have a fairlead bracket for some reason we do make one it is P/N: EMP-10906.